Vipers’ players celebrate Dan Sserunkuma’s goal against Soana. Photo by Agencies. Third placed Vipers SC will host Onduparaka at the St.Marys stadium in Kitende knowing that a win will see them move closer to both SC Villa and KCCA who play on Thursday. 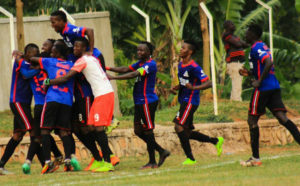 Vipers find them selves four and three points behind SC Villa and KCCA FC respectively after winning their second round opener 1-0 away to Soana on Saturday thanks to debutante Dan Sserunkuma’s goal coupled with Villa’s goalless draw at home to Marooons and KCCA’s continental engagements which saw their match with Bright Stars postponed. Their visitors Onduparaka lie one place below the Venoms on the log with only three points separating the sides. Vipers will be without Dan Birikwalira, Mousa Mbayi and Baden Ogama who are all still out with with injuries but defender Shafick Bakaki who has been training well has been included in the match day squad. Vipers have won all three of their last league games, including a 3-0 victory over Proline in their last home game. The Venoms have lost only one home game in the league since December 2016 with the solitary loss coming at the hands of URA last November. Onduparaka have seen a slump in form of recent as they have managed to win three of their last 10 games in the league(D4 L4). The Caterpillars’ away form has also left a lot to be desired as they have won only one of their last five on the road and in the process succumbed to three losses and on draw. The first game between these two sides ended goalless in Arua but Vipers defeated Onduparaka 4-1 in the reverse fixture last season. In the other big game of the day, Express FC will host BUL FC @04:30pm at Wankulukuku with head coach Shafic Bisaso still eyeing for his first three points. Bisaso registered his first point for the Red Eagles away to Onduparaka in their last league game and will be hoping better fortunes befall him at Wankulukuku as he has lost all of the two games he has managed their as a coach since taking over in November. It will not be an easy task against a Bul side that that has won all four of the sides’ last clashes including a 1-0 win here last season. “The team is in good shape and we are all in high spirit and wanting to win. Said Shafic Bisaso. “It will not be easy against an organized team like Bul but we are desperately looking and putting our heads high and start winning. Express will have to do without the suspended Suleiman Jjingo (Accumulated 3 yellow cards), Edgar Sharp Bwongi and Ronnie Kiseka (who are both injured). The other games to be played on Tuesday.